I will be the first to admit that I had a hard time getting started with black furniture, because I always seemed to gravitate toward bold, bright colors. I have had several requests and done custom work with black paint over the last year or two and have grown to really embrace this gorgeous, chic and always classic. 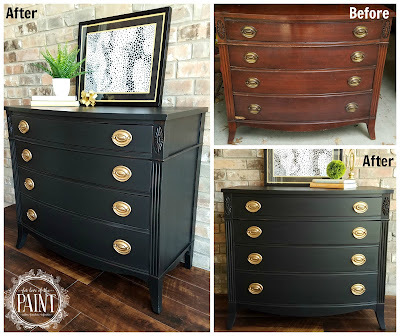 It's like a little black dress for furniture! Lately I have been using Pure Earth Paint in Onyx as my go-to black. I am pretty much beside myself with happiness on this transformation!! It is amazing what a few coats of paint, a small amount of distressing, and some gilding wax on the hardware can do to turn a (not so ugly) duckling into a swan! Are there colors you shy away from, but would love to give a try? Or techniques that seem daunting? Let me know about it! I'd love to explore those also!